Hey there, beady land! I know I am a terribly inconsistant blogger... I had hoped to do better with it this year, but so far life has jumped in front of me too many times to really pay enough attention to the blog. Today's post is one that I hope lots of people will find, however, as I am changing up the policies regarding my tutorials. I don't know about you, but I have been hearing so many things about copyright everywhere that the thought of one more discussion really makes me want to run the other way, but I was recently gently convinced to read two more discussions on others' blogs, and am really glad I did. I found out that there are many designers out there who feel as I do, and aren't afraid to market their designs in a way that feels much more comfortable for me, personally. There has been so much angst and anger everywhere in the beady world over this particular issue, and many horror stories as well of how many designers have had their work disrespected, copied, stolen, etc etc. And when someone has a policy of selling their tutorials or patterns without giving the purchaser permission to sell the finished work, or ask that a higher price be paid for using the design commercially, I respect that and support it. It's a personal choice that I think each designer needs to make for themselves. Above all else, I believe that we need to respect each others' work, and practice good ethics. I have realized that the policies I have in place on my own tutorials (no selling finished work from my tutorials without a commercial license) aren't making me happy. I don't feel good about them. I don't feel good about them because they don't reflect my beliefs about art and creativity, and they don't make me feel good about sending designs out into the world. I know there are unethical people out there that will do what they wish, and that outright copies will be made and sold, and that there are times when I won't be credited with my work. But I want to share, especially with those who have inspired me, or taught me something, or showed me a new way of looking at my beads. I want to learn, and never ever stop learning. I want to create pieces that make others want that same thing. And I want to share what I learn about how I go about creating, and my process. If there is anything I can offer to the community that has taught me so much and helped me to learn how to take my own path, I want to offer it. My hope is always that people will enjoy my tutorials, and to take whatever parts of them inspire them most, and create something later on that is theirs completely with whatever they have learned in the process. I've had some lovely ladies who created marvelous things based on my tutorials, but changed in such a way that their own creativity took them in a completely different direction in the end (one special friend in particular created a beaded bead from my Runway bracelet base!) and they ask if I mind if they sell the pieces. Do I mind?? I am ecstatic!!! I love to see them, I love that they took them places. I am truly and honestly honored, any time that I can show someone something that sparks their own creative voice. To me, this means that I am passing it on, paying it forward - and that means a great deal to me. So my decision has been that I want to change my policies and allow any work made from my tutorials to be used in any way the purchaser sees fit OTHER than mass production. The tutorials themselves - all written material and images - will retain my copyright and can't be shared, taught, or reproduced without written permission. Don't share the tutorial - but by all means, share what you learn about your own process if you can, you WILL inspire someone else along the way. My prices will remain the same, and won't go up. I realize that people who have purchased commercial versions of these tutorials will be feeling rather miffed right now, since they paid a higher price. If you have purchased a commercial version from me, please send me an email at nedale67@gmail.com and I will give you a half price discount on another pattern of your choice. Please do NOT purchase your pattern and then email me - I will set up a listing for you when you contact me. I will be working over the next few weeks to amend the wording on all of the pdfs and listings in my shop, as well as the policy statement, but given some of the things that I am dealing with personally right now, it may take awhile. So please disregard the 'For Personal Use Only' portion of them, as this public post gives permission to sell your finished work. I have a new tutorial in the works as I write this, I can't wait to show you!! 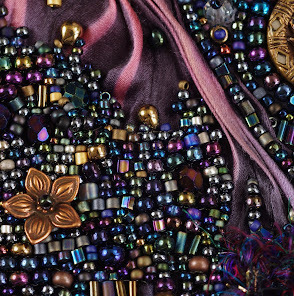 Bead happy, bead ethically, respect your designers' policies and hard work and have a fabulous week.